This is another custom from my "Blue Shirt Legion" Project. 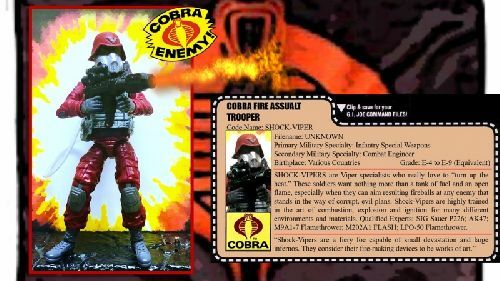 I wanted to fit the maroon Cobra Invasion Trooper somewhere into this Project. So, following HissHissFangFang's idea of "anti-Joe" Cobra characters, this guy became my "anti-Blowtorch" as the Cobra Fire Assault Trooper (yes, misspelled on the File Card, Destro's spell check must not have been working that day!). This basically a parts/accessories swap. 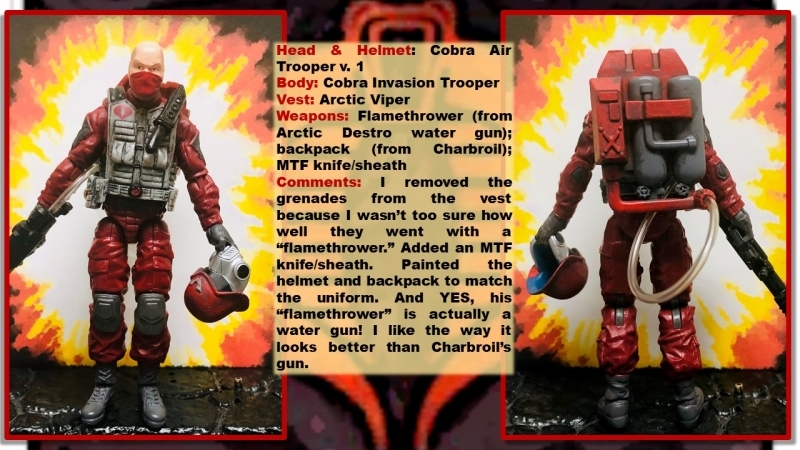 I removed the grenades from the Arctic Viper vest because I wasn't too sure how well they went with a "flamethrower" Trooper. I painted the helmet and backpack to match the uniform. The backpack is from Charbroil and the "flamethrower" is actually the water gun from Arctic Destro.